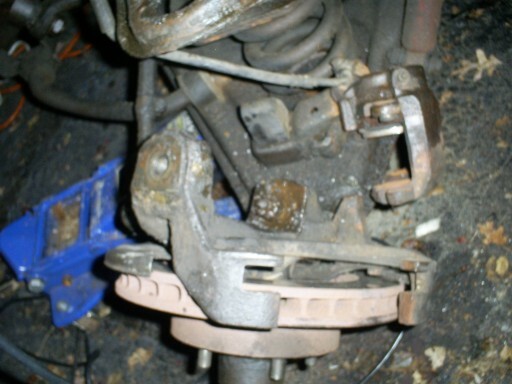 This site will show the procedures I used to replace the upper and lower ball joints on my 79 Chevy pick up 2WD. I made this site because there just isn't anything out there that explains this procedure with pictures. Just reading the words and trying to visualize this is nearly impossible if you have never done this before. Please keep safety in mind. If you are not up for this type of job, please do not attempt, It isn't exactly as easy as an oil change. Plenty of handwashing stuff like GoJO. You will be getting very greasy. Plenty of new grease and a grease gun. New upper and lower joints. Two pair if doing both sides. 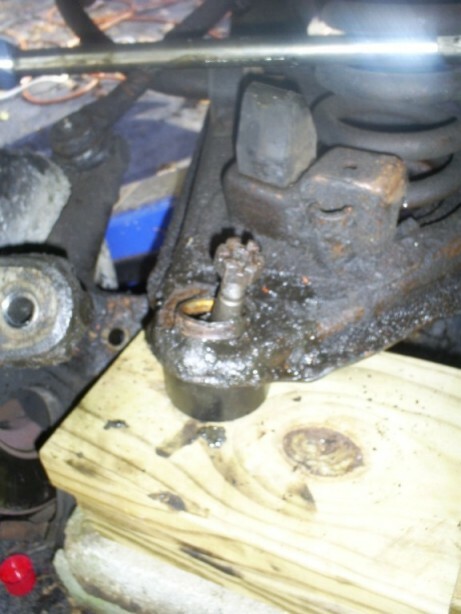 The sockets that I used were 1/4 inch socket for grease fitting, 1 1/8 socket for lower joint, 7/8 socket for upper joint, 1/2 wrench or socket for bolts for upper joint. Regular hammer and a 5lb hammer. A long threaded 1/2 inch bolt, about 8 inches long. This is simply a preliminary list. You will need other things, but, the more prepared you are prior to beginning, the less wasted time spent finding all these tools later. 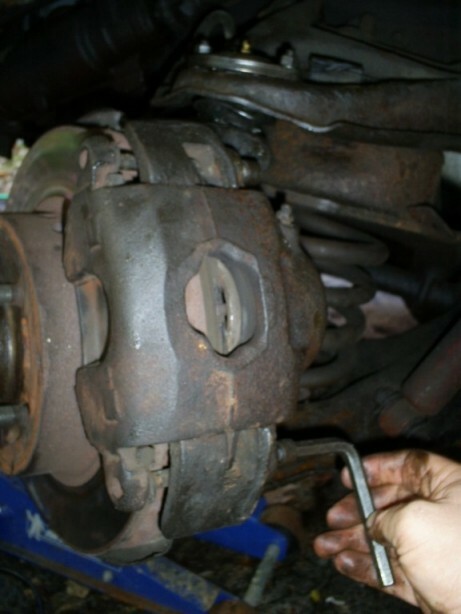 The first and foremost concern in replacing the upper and lower ball joints is safety. 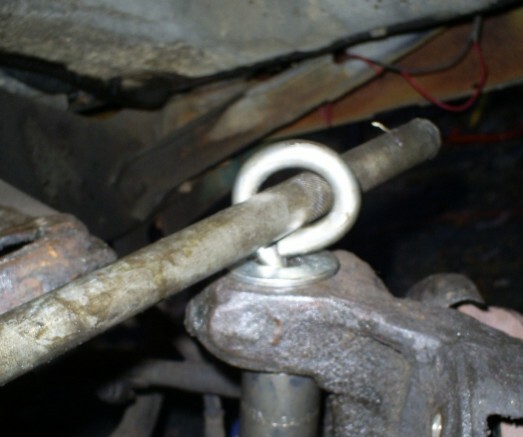 Putting a chain through part of your coil and tightening up around a secure part of the vehicle, so that the coil cannot snap out towards you is wise. There is an awful lot of pressure built up in the coil. 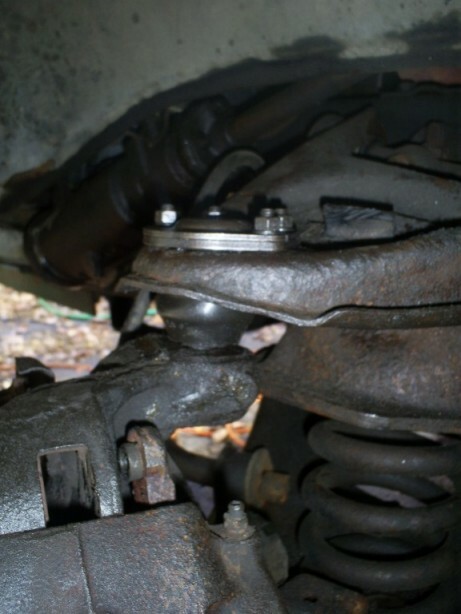 You don’t want to see the coil spring pop out, because you may then be on your way to the hospital or morgue. 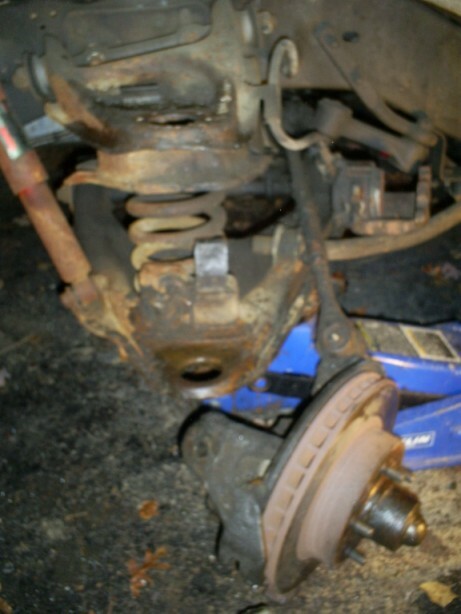 After securing the coil, jack up the vehicle under the lower control arm. 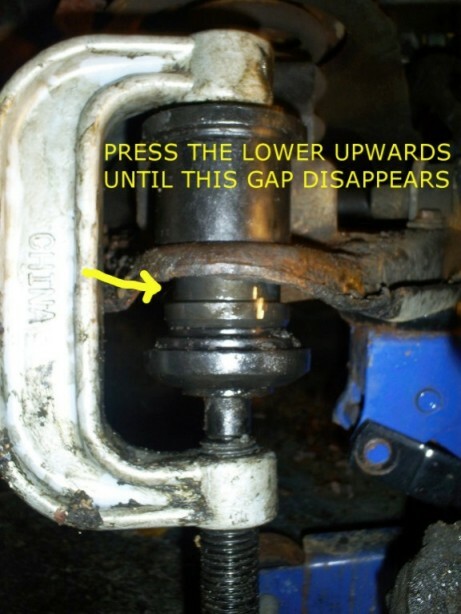 This jack will stay under the lower control arm, you will need to raise and lower this a few times during the procedure. 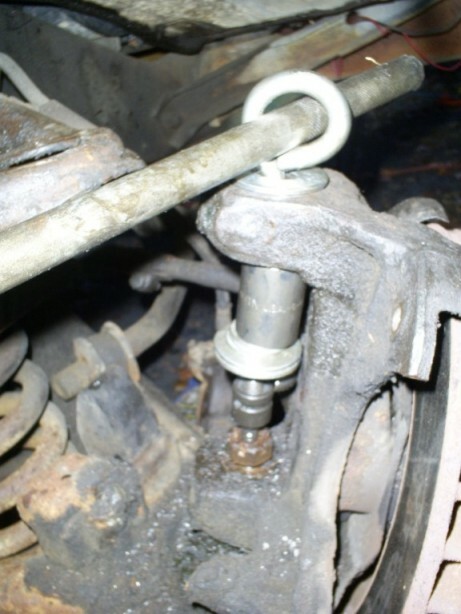 Use jack stands under the frame. 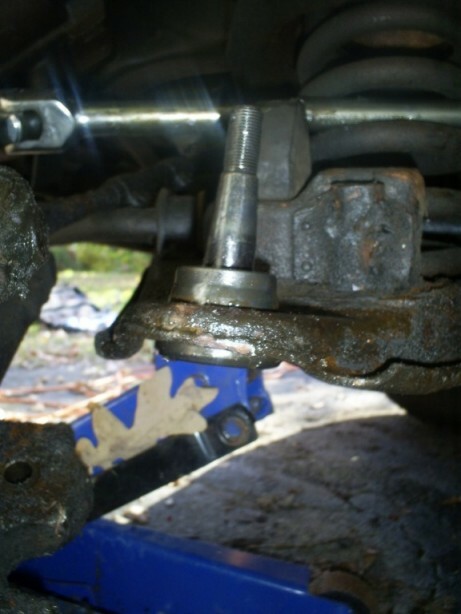 You will need to adjust these stands a few times throughout because of lowering and raising the jack under the control arm. 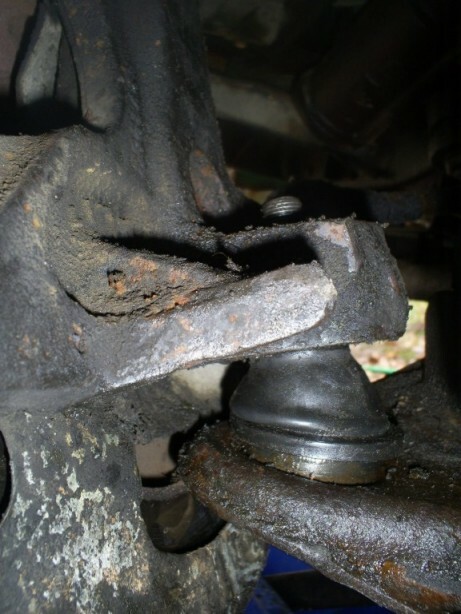 You must grind the rivet surfaces off of the old upper ball joint. 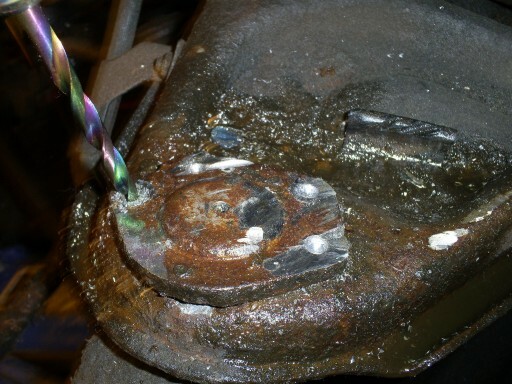 Then drill out the rivets. Eventually you will be able to pop the rivets down and out with a punch and hammer. 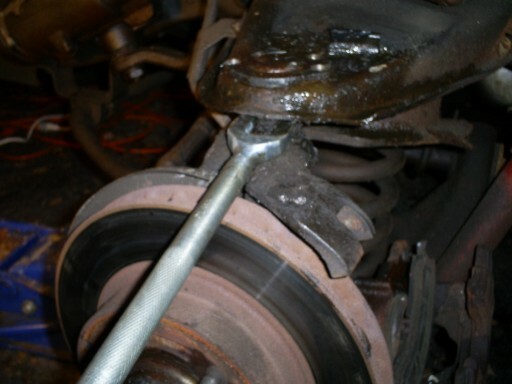 Use your ball joint pickle fork to bust loose the knuckle and the upper control arm. 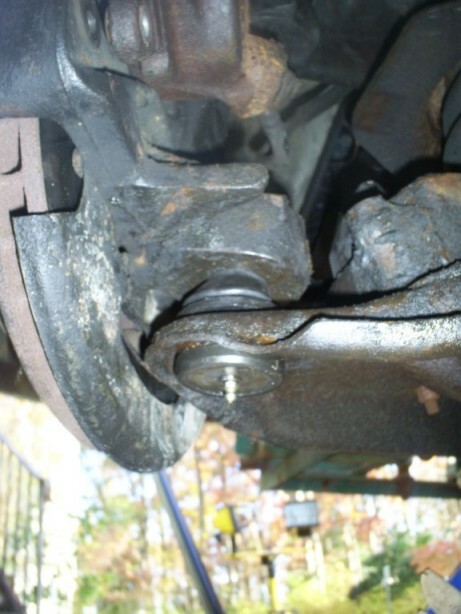 Do not use a tie rod pickle fork, these are narrower than the ball joint pickle forks and may not straddle the joint completely. That old tiger comes out after nearly three decades. Time to focus on the lower joint now. 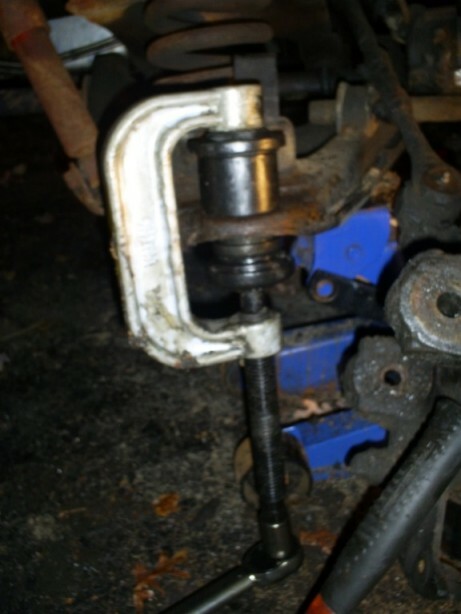 To pop the knuckle loose from the lower ball joint, I constructed a threaded tool. 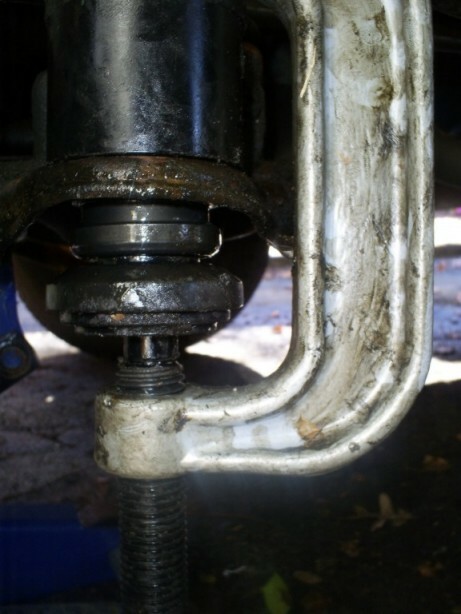 The bolt you use should be threaded nearly the entire length of its shaft. The only one I could find like that at Lowe’s was an eight inch eye bolt. I used a 3/4 inch drive socket as a spacer. 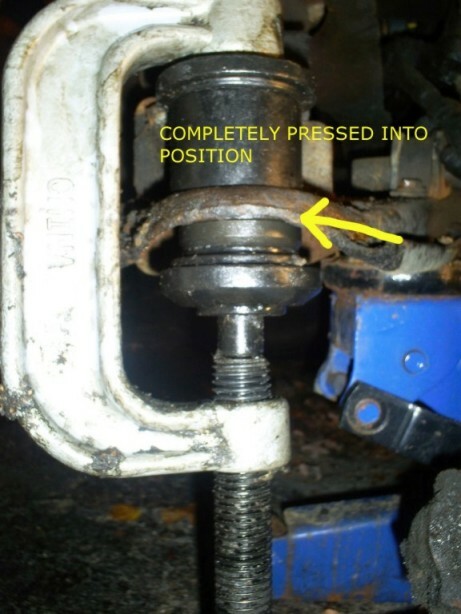 1/2 inch and 3/8 inch drive sockets will not allow the shaft of the 1/2 inch bolt to go through it. I put a nut half way down the shaft and held it with a wrench while turning the eye bolt with a long handle. I used the picket fork as a handle. After about 7 or 8 turns, POW!! 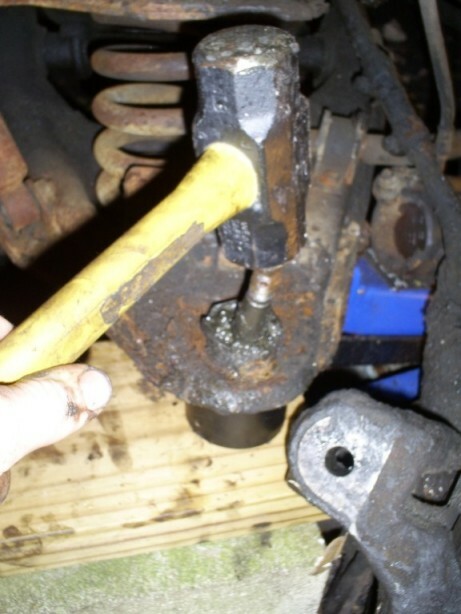 Remove the improvised tool and the knuckle comes right off of the lower joint. 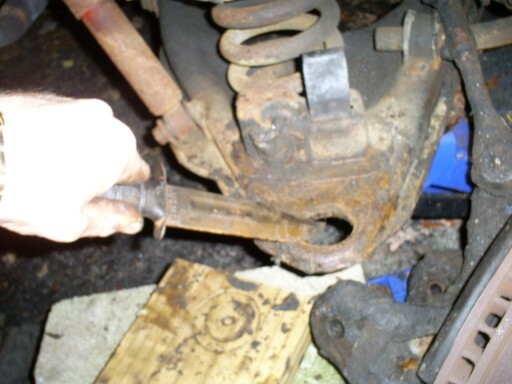 Now it is time to remove the lower ball joint from the lower control arm. This took a little experimenting. The C clamp part of the joint remover / press tool I bought at Harbor Freight was simply not long enough to fit above the shank on the lower joint and the bottom of the joint. (I could have put a cutter wheel on my grinder and cut the shank in half--that way the c clamp would have fit and pressed the joint out). So, what I found out that worked is building up a few blocks under the lower arm. 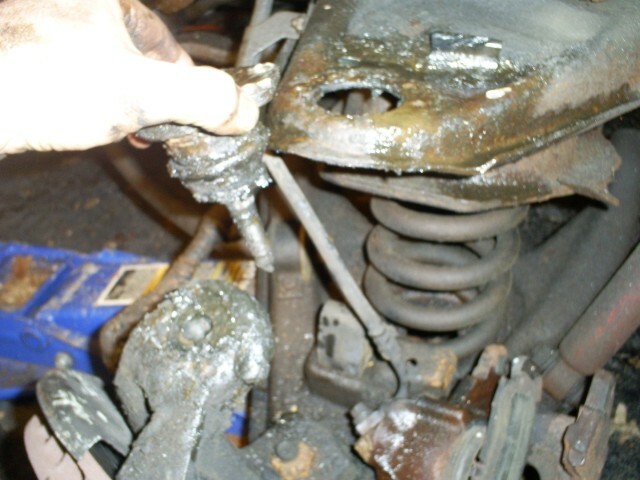 I put the cup that came with the press/remover tool under and around the lower part of the ball joint. I lowered the jack that held up the lower arm just a tad until the arm and cup rested on the blocks. 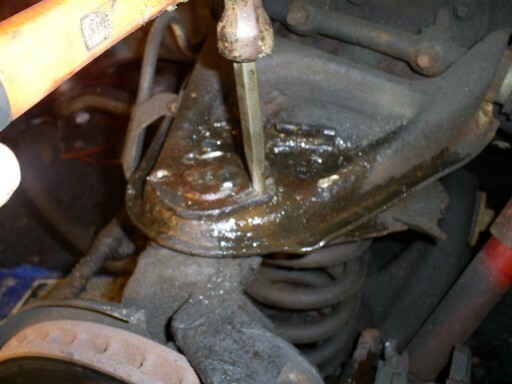 By doing it this way, when pounding with a 5 lb hammer, the shock will not permeate throughout the entire suspension and perhaps mess up something. All the force went down to the joint and blocks. About three good wacks popped that joker out. 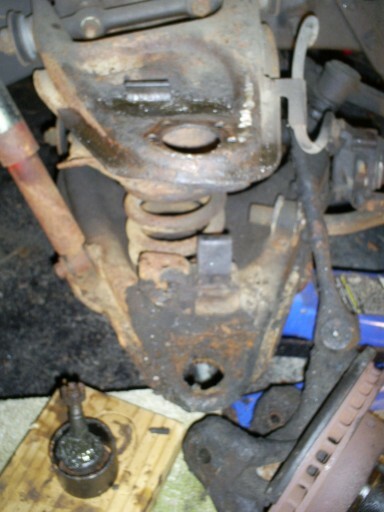 Both joints removed, just the upper and lower control arms are visible, knuckle assembly pushed to the side with just the tie rod keeping it attached. This is why we have K-Bars. 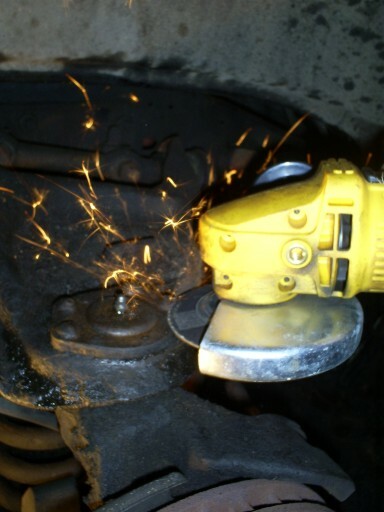 To Clean the Grease and Debris off the control arm. I did use the press/remover tool for pressing in the lower joint. It worked very well. 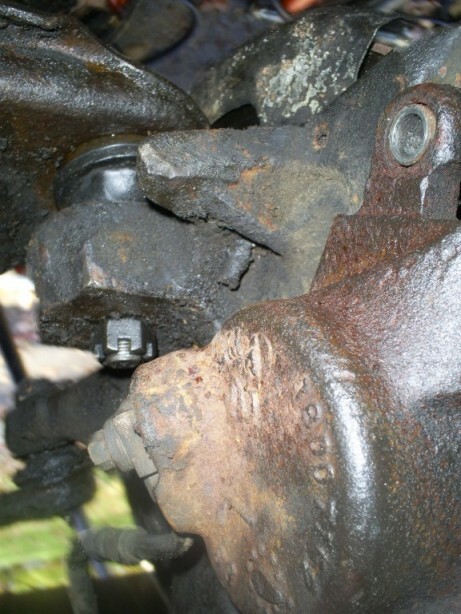 After about 15 to 20 turns with the rachet, the new lower ball joint was pressed in. Back to the upper joint. Lay the upper joint in place. Slide the rubber boot up to the bottom of the upper arm. 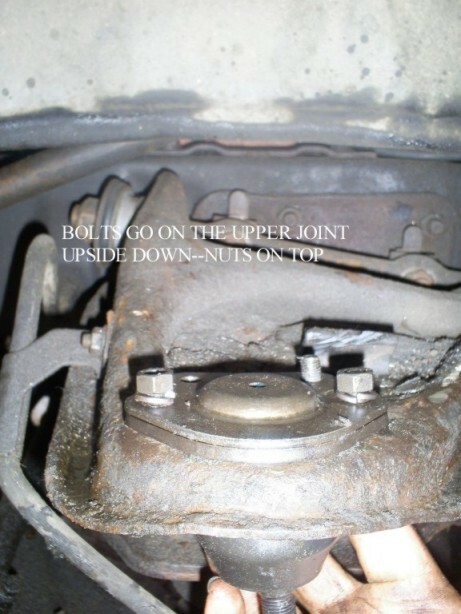 The bolts must be placed upside down, which means, the nuts are on top with lock washers. A 1/2 inch wrench is used to tighten them up. 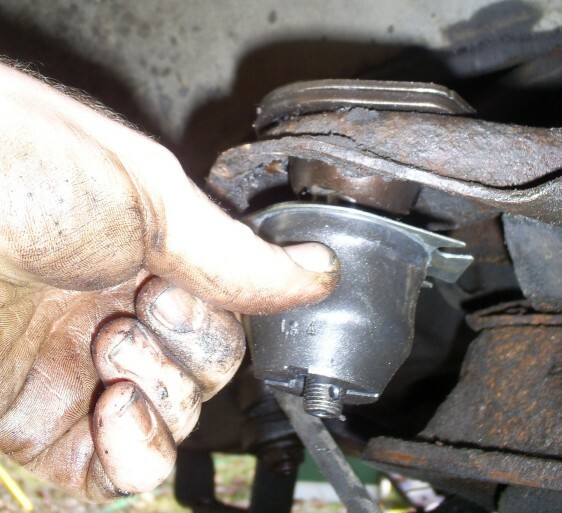 Slip the rubber boot over the lower joint. I used a cup from the remover/press tool to tap the boot down as much as possible over the lower joint. Then it is time to put the knuckle/spindle/rotor assembly back on. You are almost done...When putting the knuckle assembly on the new joints, you may have to adjust your jack under the lower arm a little. By lowering it just a tad, you get more distance b/w the upper and lower arms. 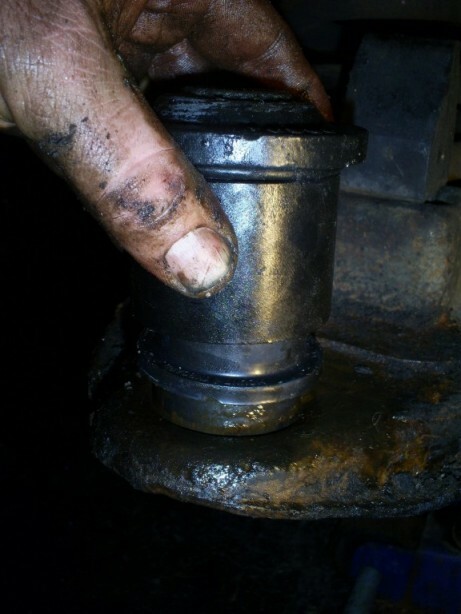 Once the joints line up in the knuckle, raise the jack until you can thread the nuts on the joints. When you torque them, the upper arm will come down to where it is supposed to be. 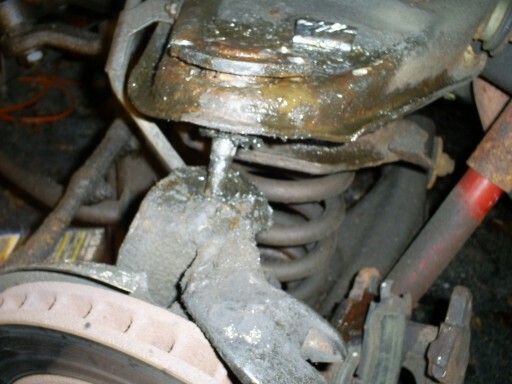 Remember, keep the jack stand under the frame at all times. You can put the grease fittings in place now. 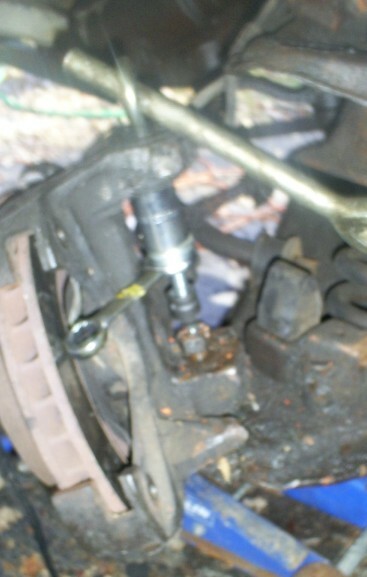 Hopefully you placed the caliper on the correct side prior to putting the knuckle/spindle/rotor assembly back on. 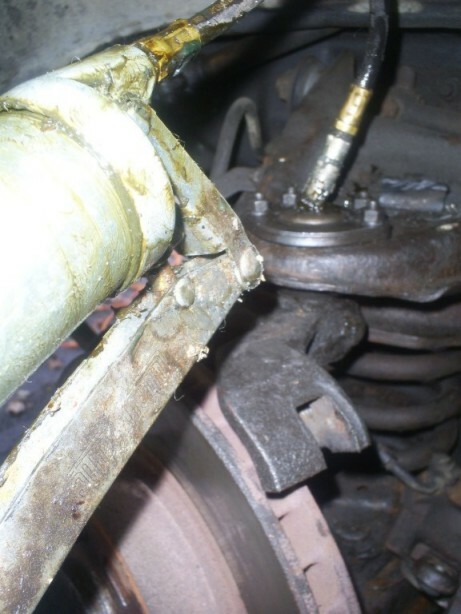 If not, you’ll have to remove the brake line then place the caliper on the correct side and route the hose back to it. Take it from someone with experience here. Time to torque the nuts on both joints. 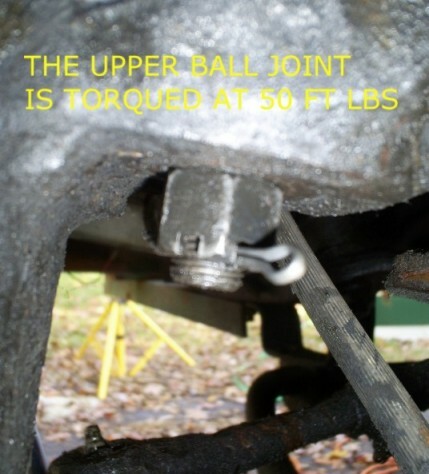 The upper bolt is torqued to 50 foot pounds or a little more to line up the cotter pin. 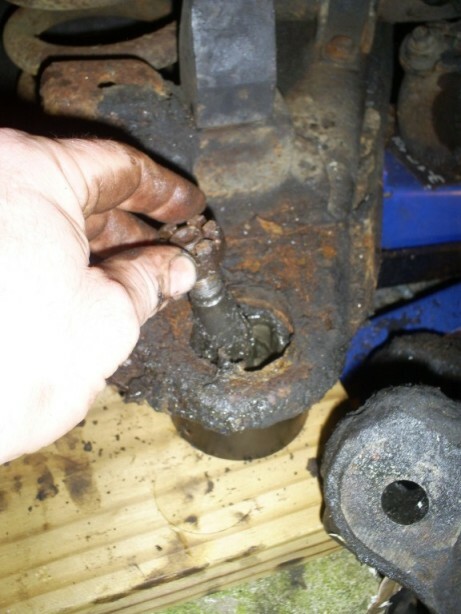 The lower joint is torqued to 90 or a little more. Time to grease up new joints. 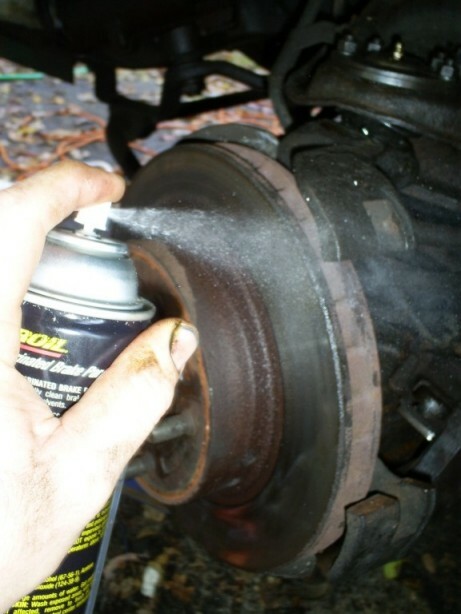 I do this prior to placing the caliper on so I can spray brake cleaner on the rotor after messing with the grease. 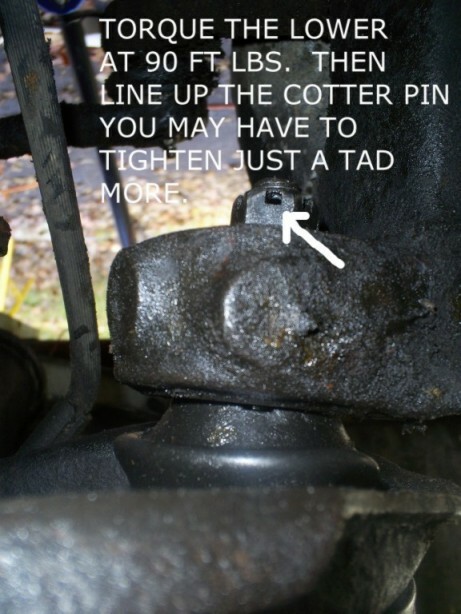 While you are there, go ahead and lube your tie rod ends, idler arm,etc..
That's it!!! New upper and lower joints installed. If you are over 21, go get a beer. Or, do the other side. Time to bleed the brakes and get a front end alignment.